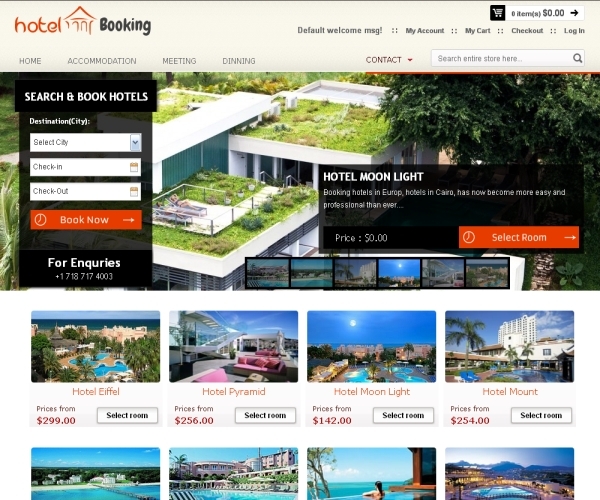 “Hotel Booking “premium Magento theme from AppTha themes is a awesome theme for online hotel booking and travel sites. It comes in a visually attractive deign scheme allowing you to showcase all your featured hotels in a stylish way. An elaborate booking module can be easily customized as per your specific requirement and allows user to make a reservation online. The homepage is a visual delight with an full-width image slider which can have your featured images along with foot note texts. A transparent booking form is aligned on the left of the slider allowing users to make a reservation online. The theme also has a second slider in the footer where you can insert thumbnail images. The rest of the homepage layout comes in a default 4 column grid for your featured hotel images. You can include a thumbnail image as well as an internal link and a “Starting From” label that helps you display the starting point of the pricing for that hotel. A drop down contact form in the header allows users to quickly send across a message without having to navigate to a different page. The theme requires Magento community edition 1.5 and higher and is cross-browser compatible. It’s built on a Div/Tableless design in accordance with the latest XHTML and CSS3 standards. The theme is also optimized for fast loading and is SEO friendly. The widget ready footer comes with an opt-in box for newsletter subscription and includes social media icons. The theme also generates RSS feeds. The theme used a multi-level header menu for primary navigation. Also included is a keyword search box, a separate top menu for account management links and displays breadcrumb navigation trail for internal pages. The powerful booking module helps you easily manage your online booking system and comes with below features. It is used to search for available hotels in a particular city during a specific date range. 1) You can set the module to have different pricing for different days as in during festival season, weekends etc. This gives you a much needed flexibility and convenience in using the system. 2) You can also set staggering pricing, set blackout days etc. 3) The theme allows you to price by the day or per hour and also set a booking time so that your support staff would always be available if the customer chooses to contact you directly at that point. The theme is highly recommended for online tours and travel sites and can be easily customized and administered from the easy to use Magento admin panel. The Hotel Booking premium Magento theme is priced at $149 and comes with included PSD files and a user-guide.